UPDATED: SEPTEMBER 21, 2016 - As timely today as when I first discovered how wonderful a spaghetti squash could be. Now that they are in season and are a great price - typically, $2-$3 for a decent sized squash, go ahead and buy one to try. Look for a squash that's about the size of NERF Football, or small football. It should feel heavy for its size and be blemish free. One of my favorite produce vendors, Viereck Farms, will be having all sorts of winter squash at their stand at the Collingswood Farmers' Market. 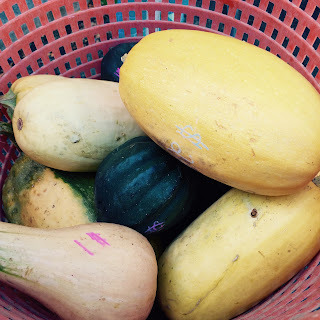 I noticed that he had spaghetti squash along with acorn and butternuts. These hold well in your refrigerator for several weeks, so if you buy one and can't decide what to do with these hearty fall and winter vegetables, you can store it in the bottom of your refrigerator. At a Weight Watchers which I used to attend, our Leader, Pat, brought up the topic of healthy food choices. She had a slew of products and items to share with the group, one of which was her favorite, pumpkin puree. She mentioned that she adds it to her oatmeal, which adds fiber, flavor and a vegetable to her morning meal. AHA! I thought, a chance to discuss some recipe ideas. I mentioned a few to the group, telling them I mixed pumpkin, tomato sauce and taco seasonings together for a Mexican Enchilada Sauce; added pumpkin to vegetarian chili; I added pumpkin to a pork stew and pumpkin stew; and lastly, to tomato sauce, or "gravy" over whole wheat pasta. Inspiration had hit me and the need to write a recipe was in the making. I've made this dish several times in the Fall, one time adding the last bit of pumpkin from a left-over can. Here I've recreated it again, with photos and a conscious effort to make it a heart and weight watchers healthy recipe. I love how the tomato sauce is packed with vegetables, adding in at least 2 servings of the daily requirement. Plus, depending on how finely they are grated, the carrots and squash seem to blend into the sauce. The carrots add a bit of sweetness and the zucchini a bit of texture. Ever since I came home from Italy the summer of 2007, I've been finding ways to make tomato sauces simpler and more fresh tasting - this is definitely one worth trying. If you have your one tomatoes that you have put up or have frozen, by all means, use them! This would also be great with a batch of fresh tomatoes that you can crush or puree at use - I'd suggest cooking them down for a bit longer then this recipe calls for doing. 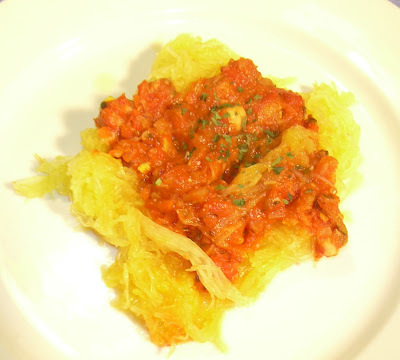 To cook the Spaghetti Squash - Cut spaghetti squash in half, and remove seeds. Place the squash, cut side down in a microwave safe bowl with about an inch or two of water in the bottom of the bowl. Microwave the squash for two- 10 minute intervals; after 20 minutes, carefully pierce the squash with a knife to see if it is tender throughout. If it is still unyielding, microwave for another 5-8 minutes. Cover the squash in the bowl with plastic wrap to finish steaming and to cool. When the squash is cool enough to handle, remove from the bowl, discard the steaming water; use a fork to scrap out the squash membranes into spaghetti like strands. Discard the outer peel of the squash and set the spaghetti squash strands aside, covered to keep warm. 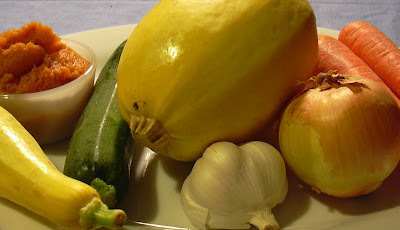 To make the Tomato Sauce - Wash and prepare the other vegetables as directed. In a stock or 4 quart pot, heat the 1 tablespoon of olive oil over medium high heat until it shimmers. Add in the diced onions and minced garlic and saute until translucent - about 2 minutes. Add in the grated carrots and saute another 2 minutes. Add in the grated zucchini and yellow squash and saute for an additional 2-3 minutes. Add the Italian seasonings and hot pepper flakes and saute to bring out the herbs flavors. Add in the tomato sauce and the pumpkin puree. If the mixture appears to be too thick, add 1 cup cold water to the mixture, stirring to combine all the ingredients. Bring the mixture to a low boil, then simmer for 20-30 minutes. Taste, adding salt and pepper and adjust seasonings as needed. If it needs more flavor, I like to add in a dash of a good balsamic vinegar to amp up the flavors, as opposed to adding more salt, oil or other fats. This post was originally published on January 9, 2008.